How a Podiatrist Can Treat Foot and Toe Conditions If you have a toe or foot condition that is causing you pain or problems when you walk, you should find out about possible treatment options. While we always hope that your foot and ankle pain can be resolved through conservative care, there may be times when surgery is unavoidable. Perhaps other conservative remedies haven’t gotten you the results you need, and a more aggressive approach is your best remaining option to regain a healthy, active, pain-free lifestyle. Reconstructive surgery. Years of wear and tear can lead to structural deformities in feet and toes, such as bunions, hammertoes, and flat feet. Reconstructive foot surgery is selected to realign bones, ligaments, tendons, and joints as necessary to reduce pain and restore healthy function to the feet. There are many different reconstructive surgery techniques, including osteotomy, fusion, grafting, joint implants, and more. Surgeries can range from relatively straightforward to highly complex. Nerve surgery. Dr. Peyman Elison is a fellow of the Association of Extremity Nerve Surgeons and has extensive experience performing surgeries to release nerves that have become pinched or compressed. Tendon surgery. Often, tendons need to be repaired surgically in the case of a rupture, since this often leads to a better outcome compared to simple immobilization. In other cases, tendons may need to be lengthened, shortened, or transferred to improve function and alleviate symptoms. Toenail surgery. 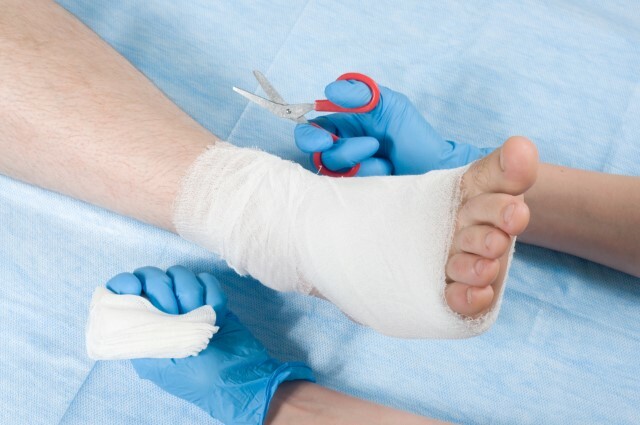 Small surgical procedures are often recommended to fix an ingrown toenail. Toenails may be partially or fully removed in other situations as well, such as a severe fungal infection, bruising, or laceration. Trauma Care. If you suffer an acute injury as the result of an athletic accident, car crash, crush injury, or other traumatic event, we can provide emergency surgery to repair the damage. Once the surgery is over, the work is really only half complete. Each procedure is collaboration between surgeon and patient, and the better you are able to follow your doctor’s post-operative instructions, the more likely your recovery and rehabilitation will be successful and relatively quick. The specific rules you’ll have to follow will, of course, vary depending on the type and location of your surgery, as well as your general health status and other factors. Generally, there will be a period of limited or no weight bearing immediately following your surgery. During this time you’ll be provided with crutches, a knee scooter, or any other tool you might need. As your foot heals, you will gradually be able to return to weight bearing activities, driving, wearing normal shoes, etc. We’ll provide a detailed timetable and check in with you on your follow-up appointments, as well as give you rehabilitation exercises to perform. It’s important to always follow your doctor’s timetables to the letter, even if you feel like you can do more—this can cause a reoccurrence of the injury or delay the healing process. In most cases, some residual swelling and pain is normal for several months after you’ve been cleared for full activity. If you do find that pain is still a serious issue, don’t hesitate to contact us immediately. We understand foot surgery is a major decision that may be frightening or scary. Fortunately, at Fixing Feet Institute, you can rest easy knowing that you’re good hands. Our licensed surgeons have spent their entire careers focused on the health of your feet and ankles, with years of experience performing many types of surgery. We’ll walk you through your options and make sure you get the care you need and deserve, every time. If you are suffering from a foot or ankle injury, deformity, or other painful condition, contact the Fixing Feet Institute in Surprise, AZ today. We can help you determine if there are any conservative alternatives to surgery that may be appropriate for your situation, as well as provide whatever care you need—surgical or otherwise. Fill out our online contact form, or call us at (623) 584-5556.